House of Ruth’s executive director Sandra Jackson spoke to NBC4 reporters about the work we do at our Kidspace Child and Family Development Center, and how House of Ruth is preparing to expand and break ground on a new daycare facility, which will double the number of infant and toddler spots offered at Kidspace. The Foundation gave $35,000 each to three women’s organizations that help survivors of sexual abuse, domestic violence, and human trafficking find pathways to healing. Washington, DC (November 20, 2018) – The Venable Foundation Inc., the philanthropic arm of the AmLaw 100 law firm Venable LLP, is pleased to announce it awarded $105,000 in grants benefiting three Washington, DC-based women’s organizations that empower and support the healing of women and young girls who are survivors of sexual abuse, domestic violence, and human trafficking. FAIR Girls, House of Ruth, and My Sister’s Place each received a $35,000 grant. “With the generous support of the Venable Foundation, FAIR Girls is able to reduce the barriers faced by young women and girls being trafficked, and assist these individuals referred to us as they safely liberate themselves from human trafficking. Through safe housing, advocacy and policy efforts, individualized client-centered services, and life skills, they need to transition from victim to survivor, in pursuit of our mission to end human trafficking, one life at a time,” said Quincy Inman, development and fundraising manager with FAIR Girls. The organization provides intervention and holistic care to survivors of human trafficking who self-identify as girls or young women. Through prevention education and policy advocacy, FAIR Girls also works to eradicate human trafficking and create brighter outcomes for survivors in the metropolitan Washington, DC area. Venable’s advocacy of FAIR Girls goes back years and has been advocated by top firm leadership, including former Venable Managing Partner and now District of Columbia Attorney General Karl A. Racine. Sandra Jackson, executive director of House of Ruth, said, “The generous donation from the Venable Foundation will help us fulfill our mission of helping women and children survivors of homelessness and domestic violence. This is an invaluable gift for House of Ruth that we will cherish.” House of Ruth meets the needs of the most vulnerable women and children in Washington, DC through 11 different supportive housing programs, a free outpatient counseling center for survivors of domestic violence, and a nationally accredited therapeutic child development center that helps homeless children overcome developmental delays resulting from trauma exposure. For more than 42 years, House of Ruth has grown in response to the needs of the community and the population we serve, and we have helped bring safety and stability into the lives of more than 11,000 women and children. Mercedes Lemp, executive director of My Sister’s Place, said, “We are excited to count on the Venable Foundation as a partner in offering survivors of domestic violence a lifeline. The support will help us address a major obstacle facing survivors and their children by allowing us to expand our transitional housing program. The inability to afford housing oftentimes keeps survivors in abusive situations. We are thrilled to be able to help more women and children rebuild their lives with the help of the foundation.” My Sister’s Place offers a full continuum of care, from emergency shelter through transitional-to-permanent housing. Their experienced team of case managers and residential counselors provides clinical counseling, case management, and comprehensive services to empower survivors to recover and thrive. The Venable Foundation Inc., now in its 35th year, has contributed more than $25 million in the last 10 years to a wide variety of organizations. In 2017, the Foundation awarded one-time impact grants totaling $750,000 to five legal aid organizations in Washington, DC, Baltimore, Los Angeles, New York, and San Francisco. Established in 1983, the Foundation supports an expansive range of civic, cultural, and charitable endeavors, as well as public interest law and legal education. These include children’s services and funding for disadvantaged families and individuals; homeless shelters and food programs; community organizations, hospitals, hospices, and local chapters of national health organizations; and educational, artistic, and cultural events and organizations. The Foundation is funded by the partners of Venable LLP. For decades, the Foundation was led by former Venable Chair and former Attorney General of the United States Benjamin R. Civiletti. His leadership and stewardship of the Foundation set the standard for Venable’s long tradition of unparalleled giving. 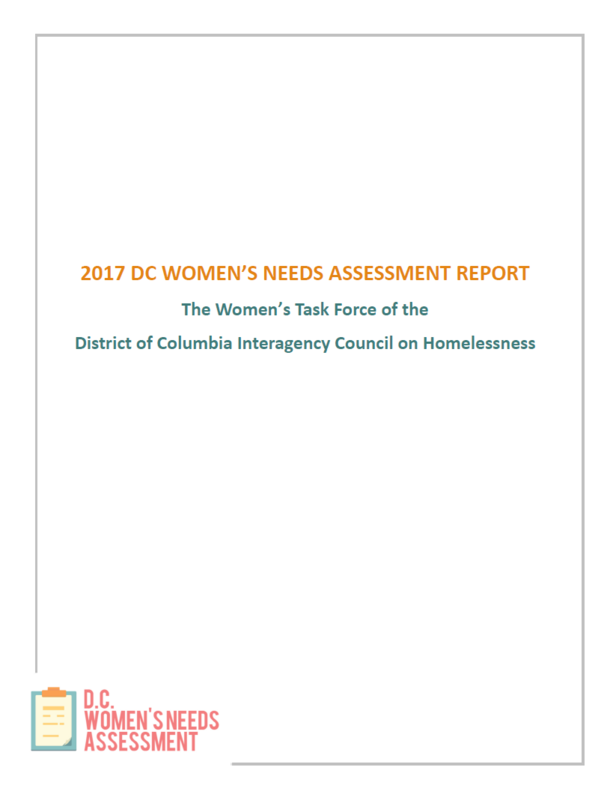 In the spring of 2017, the steering committee of the Women’s Task Force of the District of Columbia Interagency Council on Homelessness (ICH) together with The Community Partnership for the Prevention of Homelessness (TCP) conducted an analysis on gender and household type using data from the 2017 PIT Count. This initial examination revealed several distinct differences in experiences and characteristics between unaccompanied women and men. In particular, that unaccompanied women experience mental illness and domestic violence at far greater rates than their male counterparts do. Click here to access a summary of the report. House of Ruth is proud to have been a part of the 2017 DC Women’s Needs Assessment. To read the full report, click on the pdf below. In December 2017, Ford’s Theatre Society raised an astonishing $96,226.93 for House of Ruth during their performances of A Christmas Carol! The cast spoke about House of Ruth and collected donations from November 16 to December 27, 2017. In addition to a collection at each curtain call, patrons were encouraged to make donations through the Ford’s Theatre Box Office, and members of the Christmas Carol company and Ford’s Theatre Society staff contributed to the campaign. “Each donation given by audiences allows House of Ruth to provide safe spaces and services for women and families who’ve encountered domestic violence. It has been our joy to see the A Christmas Carol message of generosity come to life in this season of reflection and sharing,” said Ford’s Theatre Director Paul R. Tetreault. Click here to read the full press release by Ford’s Theatre. Ms. Lewis has been elected to a two-year term, with Anne Zummo Malone serving as Vice Chair and Darryl Christmon as Treasurer. New board members include Monica Brame, Monica Beckham, and Julie Shroyer, each of whom were elected to serve a three-year term. 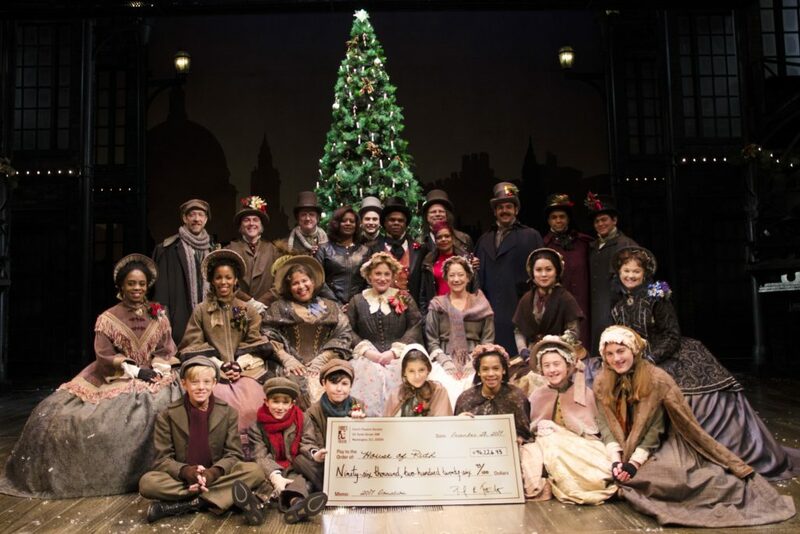 Since 2009, Ford’s Theatre Society has collected money through their annual production of A Christmas Carol for Washington, DC-area charities. Through their efforts and audiences’ generous support, they have raised more than $625,000 for charities dedicated to ending homelessness, hunger and poverty. This year, Ford’s Theatre Society announced that the cast of the 2017 production of A Christmas Carol selected House of Ruth as recipient of this year’s donation drive inspired by the themes of charity in Dickens’ holiday classic. “The holiday season is a time of great celebration and enormous need. The women and children survivors of homelessness and domestic violence at House of Ruth are deeply grateful for the generosity of the cast, crew and audiences of Ford’s Theatre. You are changing hundreds of lives and bringing A Christmas Carol to life,” said Sandra Jackson, Executive Director at House of Ruth. A Christmas Carol plays at Ford’s Theatre from November 16 through December 31, 2017. 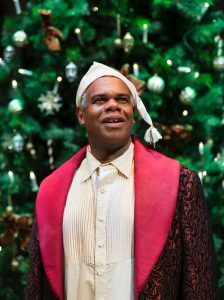 Tickets are available for sale at https://www.fords.org/performances/current-and-upcoming/a-christmas-carol/. 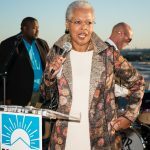 Washington, DC – Sandra Jackson, M.S.W, LICSW, LCSW-C, has been named Executive Director of House of Ruth, the city’s largest provider of housing and services for abused women, children, and families. Jackson, who served as the Interim Executive Director since January 2016, moves into the role effective November 14, 2016. In her new, permanent role, Jackson will provide management leadership in the areas of administration, programming, and strategic planning to support the agency’s mission and initiatives and to oversee its eight million-dollar budget. As the primary spokesperson for House of Ruth, she will have a visible presence in the community and will work closely with public and private partners. An executive with more than two decades of experience in social services management in the DC area, Jackson’s tenure at House of Ruth began in 2013 as House of Ruth’s Director of Operations. Prior employers include the Child and Family Services Agency and Catholic Charities of Washington, DC. “The core of House of Ruth’s mission embodies service to others. I am thankful for the opportunity to serve as the leader with such committed board members, staff, donors and community partners to continue the 40-year tradition of serving and enriching the lives of women, children and families in greatest need build safe, stable lives and achieve their highest potential,” says Jackson. Elizabeth Kiker has been named Director of Development of House of Ruth, the city’s largest provider of housing and services for abused women, children, and families. Kiker moved into the role effective February 13, 2017. In her new role, Kiker will provide leadership in the areas of development planning, donor communication, and strategic fundraising planning to support the agency’s mission and programs. As the head of the development department at House of Ruth, she will build and maintain strong relationships with House of Ruth’s major donors. An engaging leader with more than a decade of experience in successful fundraising operations, Kiker most recently served as the Executive Director at the Cascade Bicycle Club in Seattle, WA, leading the largest state-wide bike club in the US with a $6.2 million budget. Previously, Kiker was based in Washington, DC at the League of American Bicyclists, beginning her tenure in 2005 as the Communications Director and later serving as the organization’s Executive Vice President until 2013. 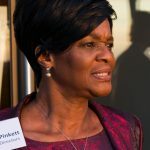 “Elizabeth brings the skills, enthusiasm and passion needed to cultivate and enhance our donor base in support of our mission of helping women and children in greatest need – a mission that she not only embraces but has supported as a long-term donor over the years,” says Sandra Jackson, House of Ruth’s Executive Director.